As we all know, there are a big bunch of videos being uploaded to the “video encyclopedia” -YouTube every day. 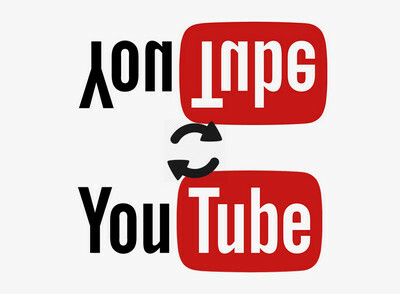 But sometimes we have noticed that a few videos are upside down or in reverse. Some of these videos may be uploaded with negligence, or directly uploaded from mobile devices. So, are we going to watch these reversed videos with our necks crooked or our monitors being upside down? It is too much troublesome. So if this is what you are going through and you are eager to know how to rotate YouTube videos, you just come to the right place. WonderFox Free HD Video Converter Factory is a free and easy-to-use YouTube videos editor. 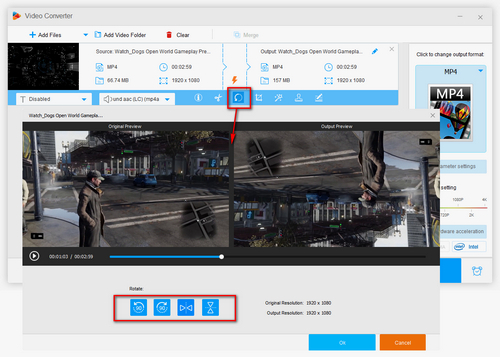 It can flip, clip and trim YouTube videos with a few clicks and also provides us a downloading function to free download videos from YouTube and other over 300 online video sharing sites. 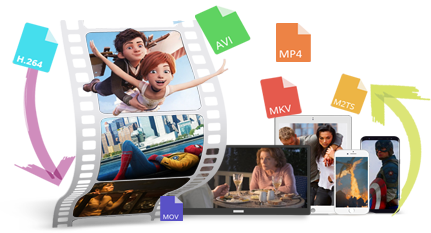 With Free HD Video Converter Factory, we can now easily download videos and edit them. 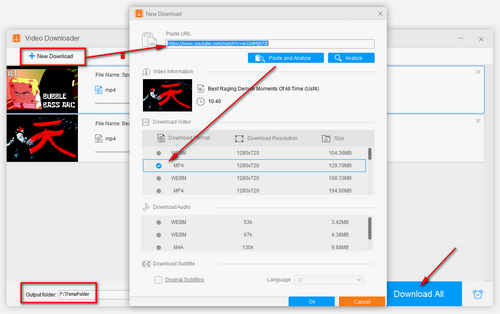 WonderFox Free HD Video Converter Factory can not only free convert videos and audio files to more than 300 formats and devices, but can free download videos and audio files from YouTube, save videos from Facebook, Twitter and over 300 videos sharing sites. Also, it offers some simple editing features, enabling us to trim YouTube videos and flip YouTube videos permanently. So, why not give it a free trial? Before we start, just free downloadfree download Free HD Video Converter Factory and install it on our computer. To rotate YouTube videos, first, free download your wanted videos from YouTube. Just click Download Video, then copy and paste the URL to the box, next, click Analyze to wait for the analyzing process. After that, you can choose the resolution and click Download button to download YouTube videos. Also, Free HD Video Converter Factory allows us to download the whole YouTube channel, or download YouTube playlist videos. After downloading videos from YouTube, you can now start with how to rotate a YouTube video. Just click the crop button and there will pop up the Crop window. Now you can choose to rotate the YouTube videos clockwise or anticlockwise, or to reverse the videos. After all the operations, click OK to go back to the main interface and click “RUN” button to start the conversion. In fact, many media players come with rotating and reversing features. So, if you prefer to flip YouTube videos with media players. Here we will offer you an easy way. Let’s take the most popular VLC media player as an example. 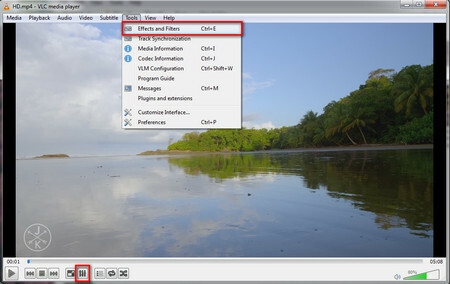 Moreover, you can use VLC to merge videos, create VLC playlists, or download subtitles in VLC media player. To rotate YouTube videos with VLC, first, play the video with VLC media player. Then, in the playing interface, click Tools on the menu bar and choose Effects and Filters, or you can just click the three arrows icon to go to the Adjustments and Effects window. 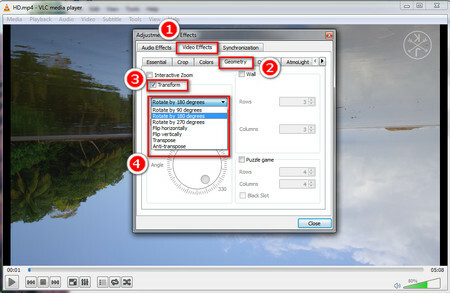 In the Adjustments and Effects window, click Video Effects tab and choose Geometry sub-tag. Then check Transform and now you can choose to rotate the YouTube videos by 90 degrees, 180 degrees, 270 degrees, flip videos, transpose videos, etc. At last, just click Close to start watching YouTube videos in the right orientation. This is how to rotate a YouTube video. Tips: Using VLC media player to flip YouTube video is a temporary method. It cannot change the original video’s form. Besides, do not forget to uncheck Transform when playing the normal videos. We have already listed 2 free and simple ways to help you rotate YouTube videos. You can choose one of them based on your own preference. But if you want to flip the videos permanently, the Free HD Video Converter Factory is a better choice. Do You Want to Convert YouTube Videos to Other Formats? In addition to downloading and editing YouTube videos, Free HD Video Converter Factory is also a great video converter. It supports converting videos and audio to more than 300 formats and devices, which greatly facilitates us watching videos and listening to music on any devices or media players. HD Video Converter Factory Pro is a more advanced video converter. It supports 4K & HD videos conversion and enhancement. Besides converting HD and 4K videos, it also enables us to compress videos with high quality preserved. The other highlights are that it supports batch processing and 50X speed up conversion, which make the conversion more efficient and faster.